1. 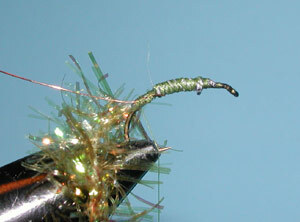 Attach the thread just behind the eye of the hook and wrap about one eye length. 2. Attach a length of lead wire and wrap about seven to eight turns around the shank. Reinforce the lead with thread wraps spirolling over the lead. 3. 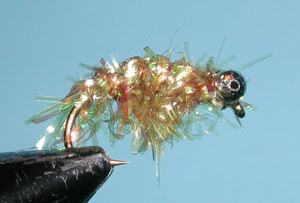 Bring the thread to the hook shank below the lead wraps and attach the Crystal Chennille as well as the fine copper wire. The material should be attached down to about 1/2 the hook bend. 4. 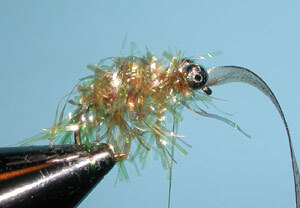 Attach the Scud Back material over the lead wraps centered over the eye. The tag should extend beyond the eye with enough material to bring back over the length of the hook. 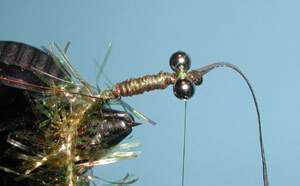 5.Tie in a chain bead eye with figure eight wraps behind the hook eye. 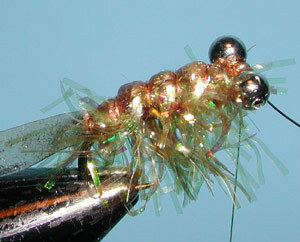 6.Wrap the Crystal Chennille forward with spaced wraps and tie off behind the bead eyes. Trim the Chennille over the back to make a smooth surface for the scud back material. 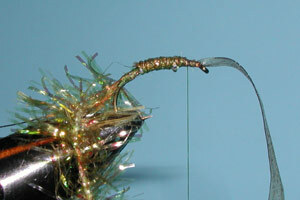 7.Bring the Scud Back material over the chain eyes toward the rear of the hook. Anchor this material with ribbing wraps between the Crystal Chennille wraps producing a segmented appearance. 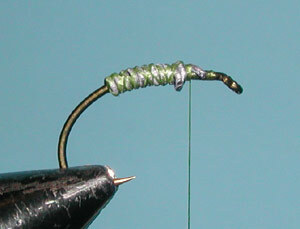 The ribbing is tied off underneath the chain eye behind the eye of the hook. 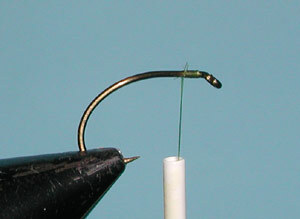 8.Finish the fly by trimming the end tag of the scud back with an angled cut just beyond the curve of the hook. Fold the scudback material prior to making the trim so that the cut produces a small dove tail appearance. Continue to trim some of the longer chennile material to produce a more compact body. Whip Finish.